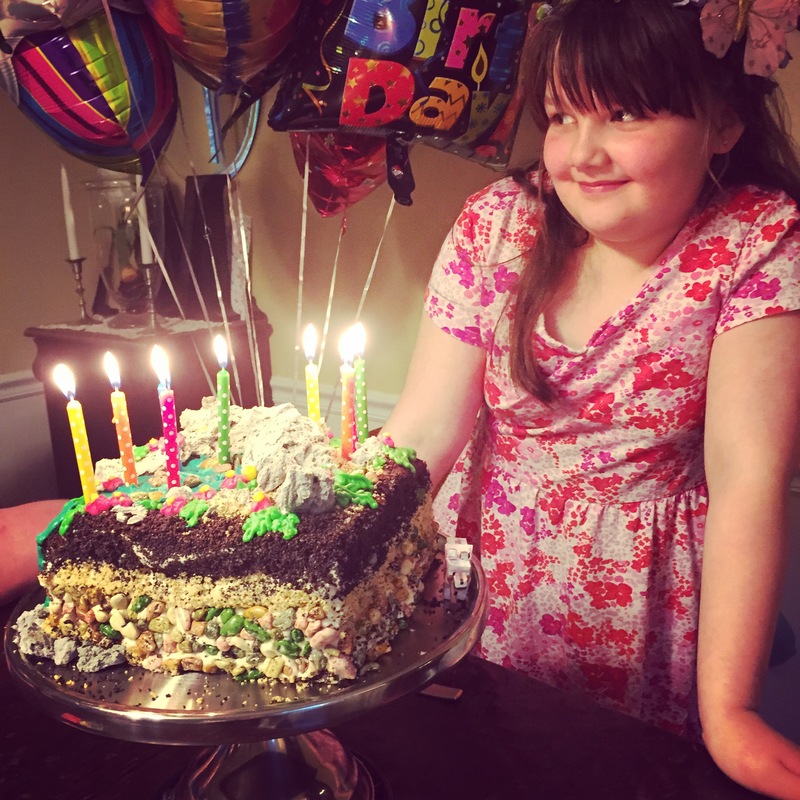 Abby turned nine. Nine times round the sun, nine years in the world and in our lives. This is my child who leaves me wondering if I’m cut out to be her mother. This is the child who brings me to tears and who’s light is at once both beams of intensity and as diffuse and gentle as rays of sun through spring blossoms. This child knows who she is, and carries herself with a noticeable dignity beyond her years. It’s perplexing, and charming, and frustrating, and baffling and enchanting to be her mother. This is the child I worry most about failing. Are these things normal for mothers and daughters? I know my own relationship with my mother is far, far more fraught than her relationship with my brothers. I know my mom didn’t innately understand me- she tried, but I was probably as perplexing to her as Abigail sometimes is to me. I remember her sometimes looking at me with a strange mix of amusement, bafflement and frustration- and I catch myself sometimes doing the same thing. It’s jarring, feeling inhabited by memory- only in this case, it’s a posture, a shine in the eye, the set of a brow. I understand my mother a little better because of my daughter. Maybe I can catch a little reflection off that understanding and help illuminate the way forward. For her birthday, she wanted a geologic birthday cake with the layers of the soil visible, and ribs for dinner. She wanted her ears pierced, and she wanted rock mining tools. Mission accomplished, on all fronts. Kelsey and I took her out in the morning to get her ears pierced, and we spent the rest of the day riding bikes, smoking ribs, and having a mercifully lazy afternoon. After dinner, when the bones were cleared away, the cake was demolished, and the presents were torn open, the rest of us gathered to watch a movie. But where was Abby? 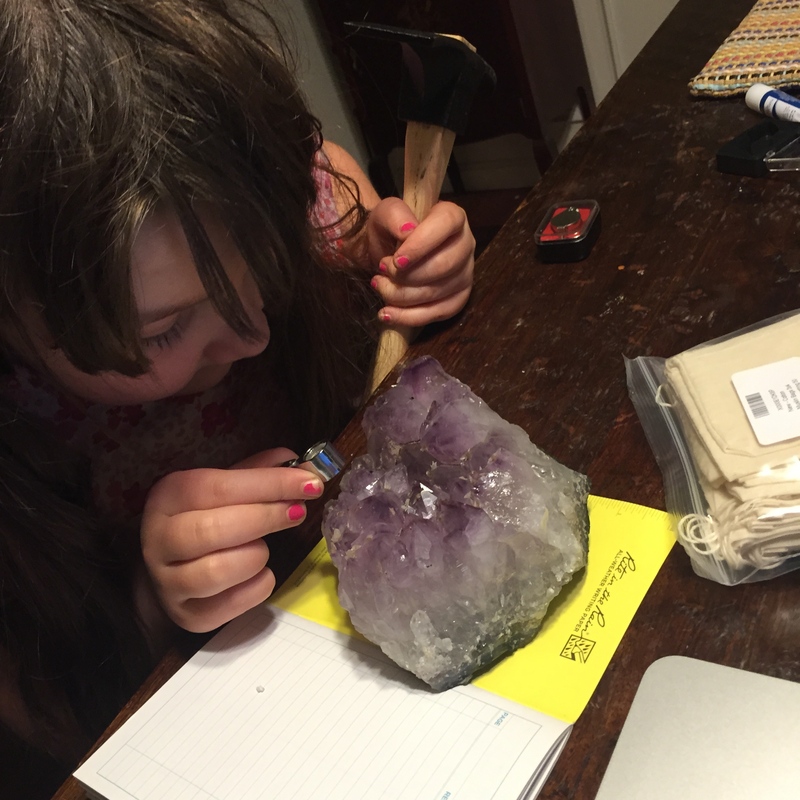 Using her new jewelers loupe, her new geology field notebook, and a pick, she was quietly chipping off tiny slivers of amethyst to examine and write field notes. She had her rock-collection bags out, and was carefully labeling and dating her samples. I sat with her a bit, watching her concentrate. I marvel at her focus, at her consistent joy in the natural world. It’s innate, she was born this way, I have felt so strongly that my job is to give her what she needs, then get out of her way. This is who she is. I gently rub her back and wander back into the family room. A few minutes later, she shoves aside the sliding door, and purposely heads outside into the dark. 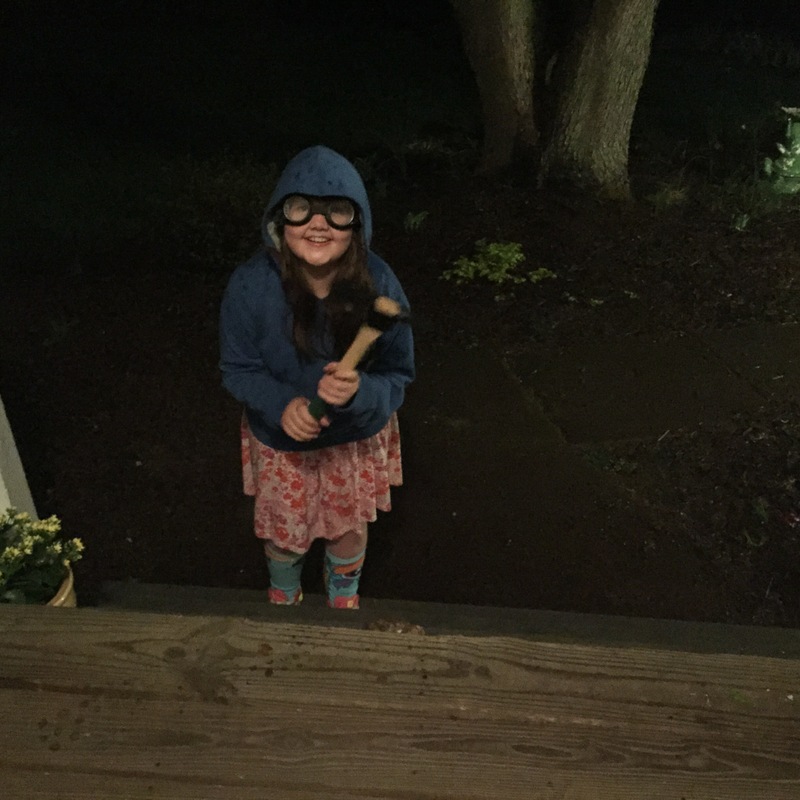 It’s pouring rain, and she’s holding her pickax and her brother’s Doctor Horrible goggles. She doesn’t even glance at the movie. Jon and I look at each other, smile and shrug. Soon, we hear a rhythmic, ringing-bright sound from the front of the house. She is on the front walkway, with a large piece of rock she found in the backyard. She looks up at me, standing in the pouring rain, her face radiant in the porch light, hood up, hair soaked, goggles on her face, a smile to light up the night. “Mom! I thought this was granite, but I think it might be potassium feldspar! !” And she goes back to pounding the rock, trying to chip off a piece she can examine. I sat on the steps just inside the front door, gazing out onto the illuminated darkness. I don’t think I have ever seen her so saturated in happiness, so utterly in her element and overflowing with joy. She wasn’t even marginally aware of the darkness, or the rain, or her siblings inside giggling at potty jokes in Antarctica. I admire you both greatly, Abby for her desire to know and learn and you for encouraging it. My 8 year old grandson asked for rocks and minerals and a microscope for Christmas . Maybe they should get to know each other in a few years! Thanks for the keen observations of our beautiful daughter. This might be the best thing I have read all week. She is perfect. I have had similar thoughts about raising my oldest daughter. It is so incredible to watch such love of learning and to see their joy in discovery. Good job. That last photo is phenomenal. She’s got a tremendous and rather unconditional fan club heading into pre-adolescence, I think you’ve orchestrated a rock-star level support system for her. You both rock. Just look at that happiness radiating off her face – the deep concentration – and the pure joy! Good job Mama! Happy Birthday Abby! Thanks, everyone. Someone recently asked me what I did to make such a little scientist, and I had to admit- I didn’t do anything. This is just who she is- I cannot take any credit. She does have an amazing support structure and some tremendous mentors, and I am so grateful for the people who love her- and have forever. She has discovered the archives here at Dandelion, and since the blog literally covers every day of her entire life, she’s fascinated- even the day I took the pregnancy test and found out I was expecting her. She’s had people cheering for her since before she was born. It’s a beautiful thing. 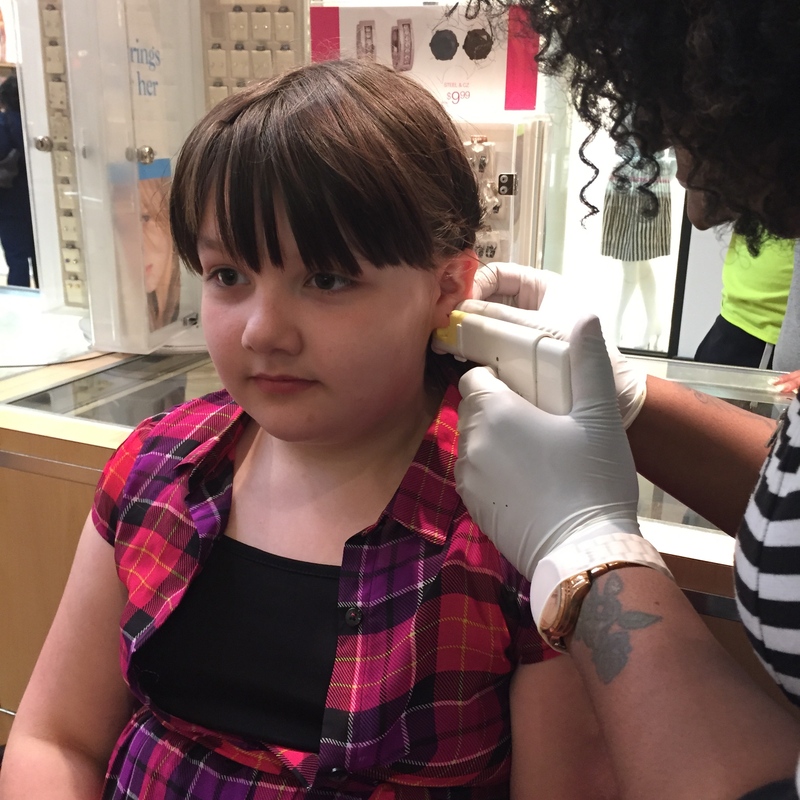 The ear piercing picture is interesting- I know she was nervous, but I see the look of determination, too. She was going to do this, come hell or high water. She’s naturally pretty cautious and thoughtful about things, but once she’s made up her mind, there’s no stopping her. Tracy, I don’t know you, but I’m one of those who have been cheering for Abby since you were bouncing on that birthing ball…bounce, bounce, bounce…I’m writing because I am a geologist–a volcanologist–and if ever Abby has a question to which she can’t find an answer, I would love to be a resource. I don’t know if you will be coming Utah County way anytime soon, but if you do, I’d love to give Abby a tour of the Geology Department at BYU, and show her cool microscopes and all. I don’t know if you can see my email address when I comment, but it’s really easy: at gmail, volcano. Happy birthday Abby! Keryn, thank you! We’ll be in Utah this summer for two weeks (end of July, first part of August). I would love (LOVE!) to take you up on your offer! I’ll email you. A million thanks!